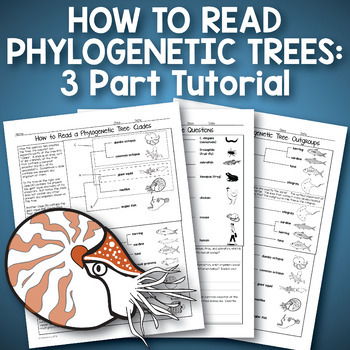 Students will learn step by step how to read a phylogenetic tree. Phylogenetic trees are difficult for many students to understand. 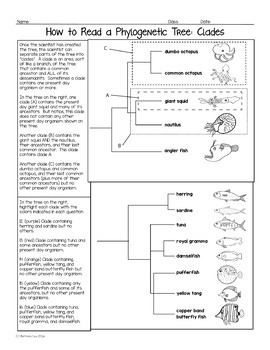 The way trees are drawn has very specific implications and students often struggle with determining relationships between organisms in different parts of the tree. I designed this to really help students break it down! The first part has two pages: a reading and then a question page. 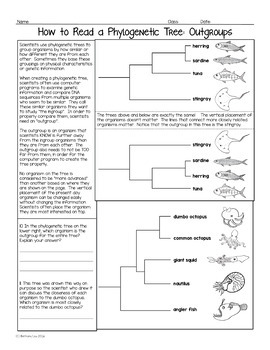 This page focuses on the nodes and branches of the trees and determining the common ancestor of organisms. The second part discusses outgroups and in-groups. The reading and questions are on one page. The third part discusses clades. The reading and questions are on one page. 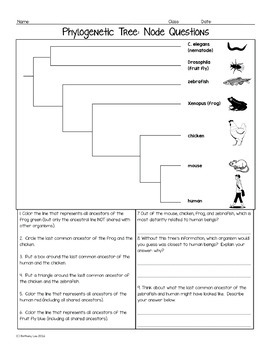 Are you looking for a comprehensive bunch of homework pages for your Evolution Unit? Check out my 9 page Evolution Homework Bundle which covers Hardy Weinberg, phylogenetic trees, geologic time, and gene flow. Alien Evolution: A Hardy Weinberg Introduction - Hardy Weinberg without all the math! If you have any questions, suggestions, or corrections, please leave a question on the question and answer section of my store and I will get back to you quickly! **Look for the green star near the top of any page within my store and click it to become a follower. You will then receive customized email updates about this store. * make copies for your own classes only. AS LONG AS no other teacher has access to that class webpage. This resource is for you, the purchaser, alone. * make copies other teachers or their classes. * distribute this digital resource to other teachers. * post this resource on any webpage or server that is available for public view, for other teachers.